UT Head Coach Jason Candle announced yesterday the Rockets have added 20 signees and seven preferred walk-on student-athletes to the 2019 football recruiting class. For the third straight year, UT has compiled the top recruiting class in the Mid-American Conference, according to 247 Sports. This is the fourth recruiting class for Candle as head coach, and the third to be ranked as best in the MAC. Toledo’s 2017 and 2018 classes also were ranked No. 1 in the conference by all major recruiting services, and his 2016 class was ranked No. 2 in the MAC by 247 Sports, and No. 3 by Rivals and Scout.com. Candle and his staff signed players from eight different states, including 10 players from Ohio, seven from Florida, and three from both Michigan and Pennsylvania. Georgia, Indiana, Mississippi and North Carolina also were all represented. 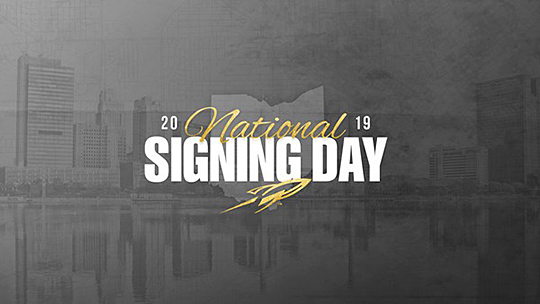 Read more about the recruits and see videos on the Toledo Rockets’ website. This entry was posted on Thursday, February 7th, 2019 at 3:27 am and is filed under Athletics, News .